Terminal > Newsfeed "World news"
Oreanda-News agency is one of the first independent news agencies of the contemporary Russia. Founded in 1994 in Moscow, currently the headquarters is located in St. Petersburg. The main activity is the production of economic, political, cultural, sports news. The agency operates in a daily and round-the-clock mode. The overwhelming majority of news is available only to subscribers. More detailed information can be found in the section "About company". At present time all news is divided into 12 newsfeeds available through the Terminal. 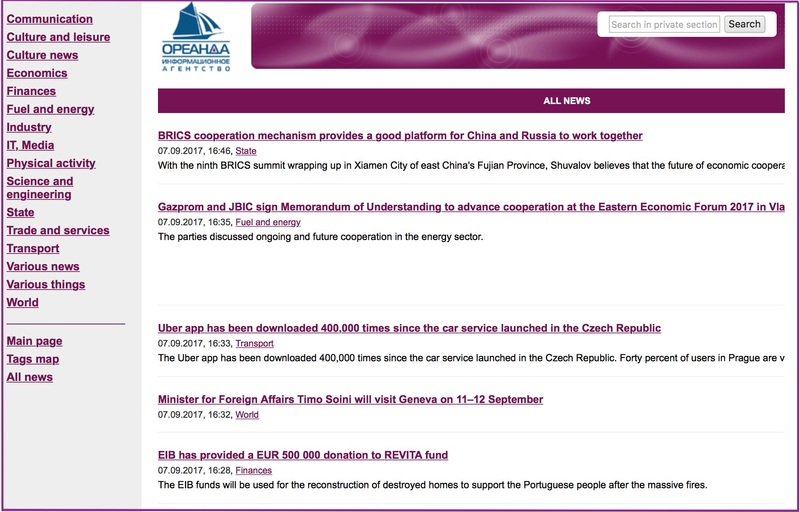 The newsfeed "World news" contains about 300 messages at month, allowing to agency's clients to be well informed about top-events and incidents, news of international forums, foreign policy decisions, activities of leaders and top-figures of the international community, a lot of other things. The newsfeed in English covers events on a wide world space. The agency also produces the newsfeed "World news" in Russian, which covers the events of this sphere mainly in Russia and the countries of the former USSR. If you want to subscribe to newsfeed "World news" (or other newsfeeds of Oreanda-News), please leave your request. "Mass media and IT news"
"Physical culture and sport news"